Auto racing and her husband (sculptor Stephan Weiss) were Donna Karan’s inspirations for her first men’s fragrance — DK Men (released in 1994). DK Men’s interesting bottle was designed by Weiss in the shape of a gear shift/throttle (image, right) and the DK Men TV commercial’s soundtrack was the noise of a revving engine. Karan wanted DK Men to convey “power” and said: "When I see my husband -- the guy with the toys, the cool dude, the hottest guy around -- it's always with his hand on the throttle; it's always power." 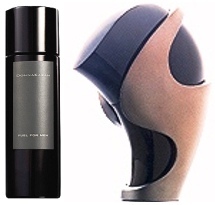 (Women's Wear Daily, 7/15/94) Donna Karan Beauty Co. sold its fragrance license to Estée Lauder in 1997 and DK Men was discontinued; DK Men, rechristened Fuel for Men, has just been re-issued as part of the Donna Karan Collection of fragrances (image, left). Fuel for Men opens with a strong (and energizing) gingery citrus accord (quite nice). Soon after application, the perfume begins to “soften,” becoming silky, almost talc-y. I wore Fuel for Men three days in a row while writing this review and each day the fragrance smelled slightly different on me, especially in mid-development; on day one, I smelled tobacco, the next day a faint fragrance note reminded me of the scent of dried gasoline on skin, and today I smell a leather-musk accord. Fuel for Men seems to fragment on my skin, and after application, it can smell different on my right arm than it does on my left arm: only the great opening notes and the base notes (sweet, powdery musk and sheer woods) smell the same on each day of wear — no matter where I spray. I like Fuel for Men’s notes and phases, and the fragrance has good lasting power and perfect sillage (minimal). I’d love to know how Fuel for Men compares to 1994 DK Men; unfortunately, I never smelled DK Men. I hope Fuel for Men smells just like DK Men because, judging from perfume websites, there are lots of men out there who loved DK Men and missed it. (If you’re one of those men and have smelled Fuel for Men, please comment.) Though I like Fuel for Men, it’s not the “racy,” strange fragrance many DK Men reviews led me to expect; maybe the formula has been tweaked (almost a certainty) or perhaps what smelled “different” 14 years ago, now smells more mainstream. I’d categorize Fuel for Men as a pleasant and comforting perfume made with good-quality ingredients, and the consumer I visualize as I wear Fuel for Men does not exceed the speed limit, let alone own a racecar. Donna Karan Fuel for Men is available in 100 ml Eau de Toilette ($85) as part of the Donna Karan Collection. For buying information, see the listing for Donna Karan under Perfume Houses. As of this post, Fuel for Men is unavailable for purchase in the U.S. online (“temporarily out of stock”); is the perfume cursed or did Donna Karan underestimate demand? Update 12/08: A Now Smell This reader was kind enough to mail me a sample of the original DK Men fragrance; to my nose, it smells almost exactly like DK Fuel for Men (the age of the DK Men sample may account for its slightly "deeper" aroma). Hi Kevin. All I can say about that original bottle is Robin's standby: I'd spray it in my eye for sure. I can't verify this as fact, but I remember when I bought my bottle way back when the scent first came out, the SA at Lord & Taylor told me that there was an actual “fuel resin” note added to the scent. Consequently, the “fresher, lighter” version of Fuel, called Unleaded, lacked this resinous note. Joe: wondering if the nozzle points UP or DOWN? Tim: perhaps we're in ethanol territory now in 2008? I'm betting original DK Men was more powerful than today's version…. This fragrance, along with another previously discontinued fragrance, Chaos, are available at NYC's Bergdorf Goodman. I owned a bottle of the original 'Fuel'; while I'm no cosmetic chemist or nose, the new incarnation smells just like the original. In my opinion, it was a scrubber then, and it's a scrubber now. Smells like gasoline. I had a bottle of this in the 90s, but I probably won't remember it well enough to judge old vs new. Stil, I am looking forward to trying this new version. Julien: I wish I got MORE gasoline from this one…thanks for writing in…so far, we must rely on your memory. Just checked Bergdorf and Fuel is still on backorder online…maybe they have some at the counter…. monkeytoe: maybe smelling the reissue will revive old scent memories…. So, you're one of them, eh? I mean you're one of those people who love the smell of gasoline and gas stations! I know plenty of 'em and I suppose they'd be very fond of Fuel! Me? Not so much. Having said all that, I'd much rather have someone smell of even a personally disagreeable fragrance than to have them smell of NOTHING at all. Is that crazy? I had a bottle back in the 90's and I remember liking it, but I don't have a terribly clear recollection. I do remember a kind of rubbery/gasoline sort of note, that struck me as either exotic or annoying depending on my mood–probably the “fuel resin” alluded to above. The bottle was really cool, though. I love the smell of diesel fuel in particular. And I need a sample of this. Wordsmith: was the bottle easy to use? Exist: forgot about diesel…and I always loved the smell of a potbelly stove burning coal…. If I remember correctly, the nozzle–the opening–is on the other side of the black top part: you press in on that curved black area to spray it. Does that make any sense? In other words, if you reached for that bottle, just as you see it, with your right hand, placed your index finger on the curved portion, turned your whole hand around so the palm was facing you, and squeezed, you'd get spritzed. I'm pretty sure that's how it worked. I could be wrong. It's been years. But I bought a bottle almost the day it came out (I can still call the smell of it to mind); it was like nothing else on the market. Now it wouldn't be that jarring, I think; there's been a whole lot of water under that bridge, most notably Bulgari Black. Pleasant and comforting? Really??? When I tried this I was assaulted by the smell of burnt crayons and rubber. Couldn't pick up any gingery citrus or talc at all. I wonder if Diesel has a possible case in registered trademark infringement lol. I seem to recall that the nozzle was actually on the side of the bottle rather than at what seems to be the “front.” (pyramus explains it well). The first time you used it, it might have taken you a minute or two to figure out how it worked, but that was all. It's much more conventional than it looks. P.S. I would also agree with pyramus that while it seemed a really radical fragrance for 1994, I don't think it would be especially jarring now. Ya, many do like the smell of Diesel and other fuels. In early ages I used to like it. But hate it now because got tired of smoke and burnt fuel smell. But one must remember that we wear a perfume to reveal it i9n the public. It does matters what others feel about it! pyramus: ah…if only you had kept the bottle…they must be as rare as hen's teeth…took me forever to find a photo of it! eminere: maybe my nose is “jaded” these days but not a hint of burnt wax or rubber for me. too bad! passionbee: after wearing Fuel three days…I can honestly say i offended no one…people liked the smell. When I've tried this one, instantly I associated with old lipstic scent. My Mom used some lipstic reminding this scent about 20 years ago. I found interesting and I would wear it myself For me it is similar to a character of Frederic Malle Lipstic Rose perfume. His description is accurate. I still have my bottle. And it's more than half-full. In the picture, it looks as if the cap is still on the bottle. Oana: this seems to be one of those scents that DOES smell different on everyone…I didn't pick up any floral note at all. Did noone smell the pineapple in this? I didn't like Fuel when I sampled it about a year ago (prior to this re-issue) and I thought it smelled like a mixture of thinning agent and pineapple juice. Blech! Noe DK Chaos – that's some brilliant stuff! Mike: not a smidgen of pineapple on me, or turpentine. I have a sample of Chaos on the way…seems to be everyone's favorite. Nope, no pineapple that I can detect. Just the fuel resin and lots and lots of sandalwood on the drydown. I have not tried the reissued version, but I use to buy it when it first came out. I love the body product they had best products. The original on my skin reminded me of a new leather jacket, and gasoline, it was original. I always got compliment wearing it.